I have to start today’s post with a little silly horse bragging. Tuesday’s vet appointment was first thing, and there was a real chill in the air. Between the crisp temperatures and the fact that everyone else had been turned out, Derby was a bit wound up. 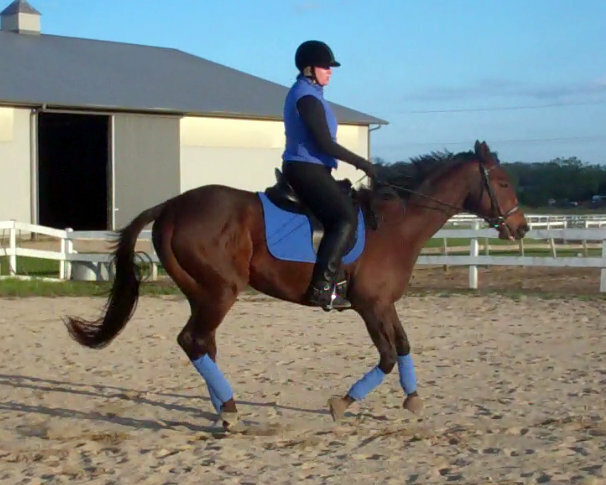 So I put him in the outdoor arena to work off some steam before the vet showed up. Work it out he did – running, bucking and farting – before finally having two good rolls in the sand. Then he went and grazed the clover and tufts of grass growing along the edges. Out of the reach of the mower, and recently rejuvenated by some rain, the edges of the arena provided some good eatin’. After 15 minutes or so, the vet rolled in. As they were unloading their things, I went up to the gate and called Derby to me. He picked up his head and sauntered across the area to me. My vet’s assistant happens to be Derby’s old owner. She was amazed that Derby – who is very food motivated – would leave grass when I called. He’s such a good boy! Now on to the vet visit. The good news is that the scoping showed zero inflammation of the airway, and zero lesions. But there was some bad news too. Derby has started to aspirate food into his airway. This is the very last thing I wanted to hear, because aspirating food into the trachea can lead to choke and pneumonia. Scary stuff. We talked about surgery, but in the meantime, because the matter appeared to be hay, the vet told me to soak his hay. She also told me not to worry too much – the coughing he does clears the airway. That explains why I’ve been experiencing more coughing lately. 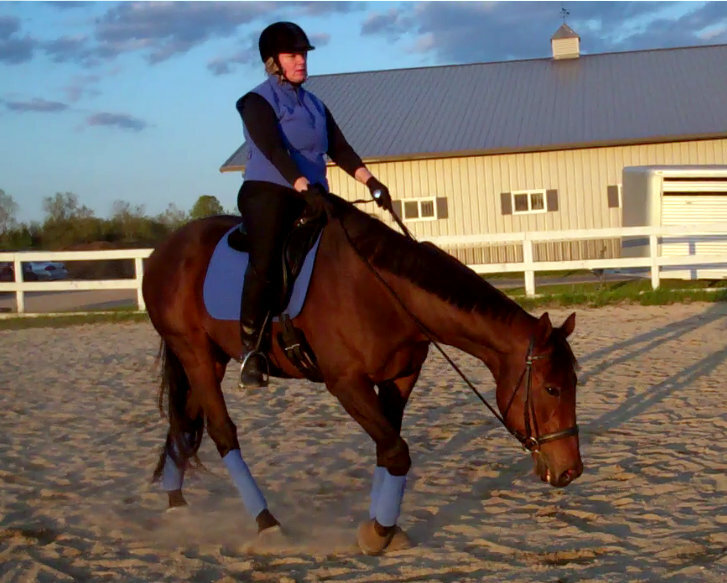 I focused on using my inside leg to engage Derby’s hind legs, getting him to step up under himself and engage. 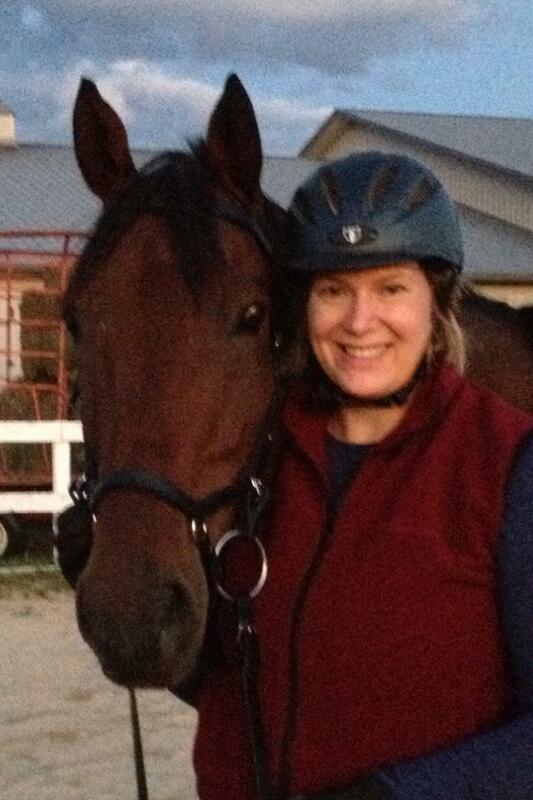 On Tuesday night, I rode after Derby had his evening feed. 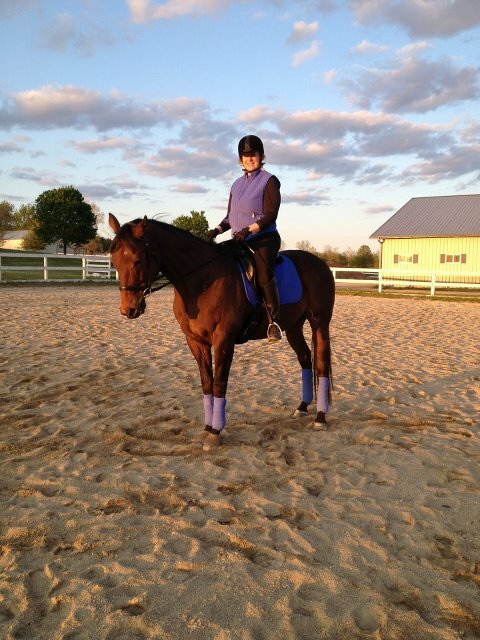 It was a beautiful, cool night, and he felt great – a little coughing at the beginning of the ride, but then he was pretty quiet. Last night was the same story. The wet hay really seems to be helping! Our hay has been very crumbly – the flakes almost fall apart. This is due to the drought -the plants are short, dry and stunted. So instead of having nice, long blades of grass and other plants, the hay has little scraggly bits. And he must be sucking those into his airway. So hopefully we’ll dodge a bullet by continuing to soak his hay! That beats the socks off tie-forward surgery, which is big surgery (the horse is fully out, on his back) and carries no guarantees. 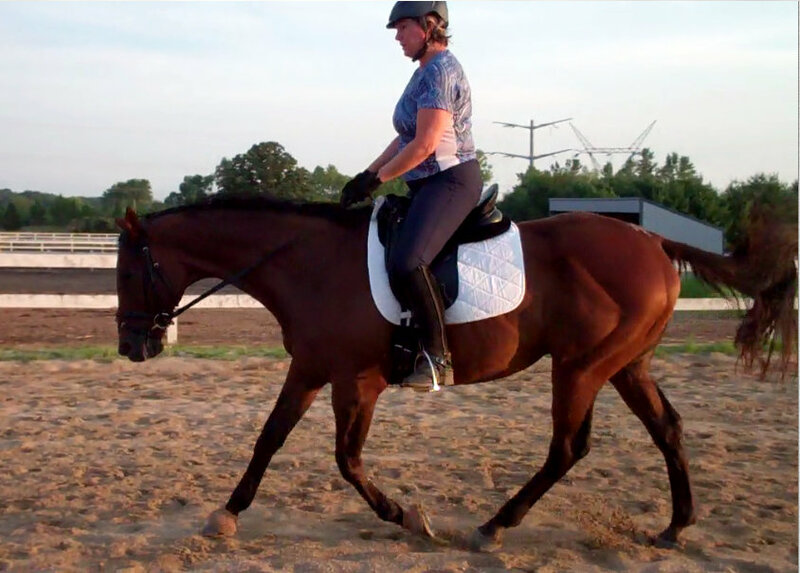 In our lessons this week, we’re focusing on two things – maintaining strong, forward gaits, and activating Derby’s hind legs. As I’ve mentioned before, these are two historically weak areas for me. 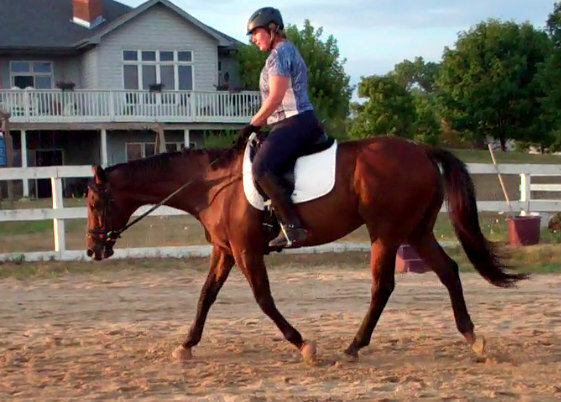 On Tuesday, the focus was really on bend and getting those hind legs to step under. On Wednesday, it was more of the same, but we added extra focus on gait quality. 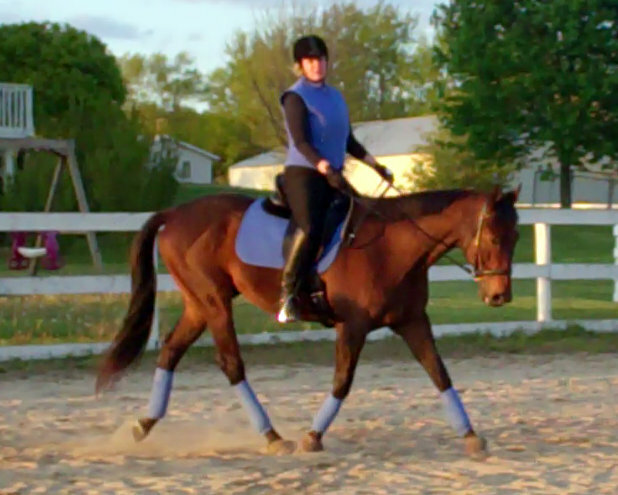 I caught myself twisting in the saddle again on Tuesday, causing the horse to fall inward, and forcing me to refocus on my position. 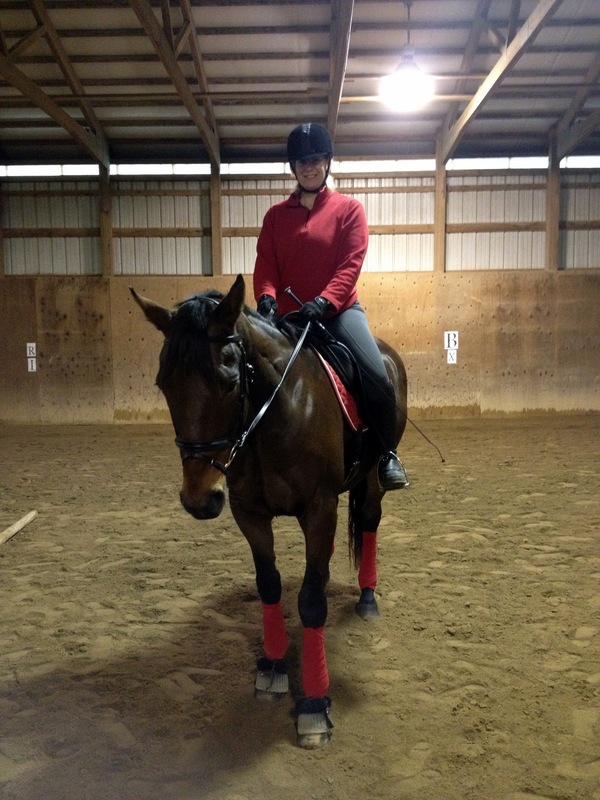 Christy helped me through this by telling me not to worry about fixing my legs (which I was – my outside leg would creep forward, and my inside leg back – ugh) but instead had me focus on my seat and leading with my inside seatbone. That was the solution to the problem. We were able to spiral in and leg-yield out nicely. We’re working on engagement at the canter. The nice moments are coming more frequently, but we’re not yet maintaining the “niceness” all the time. 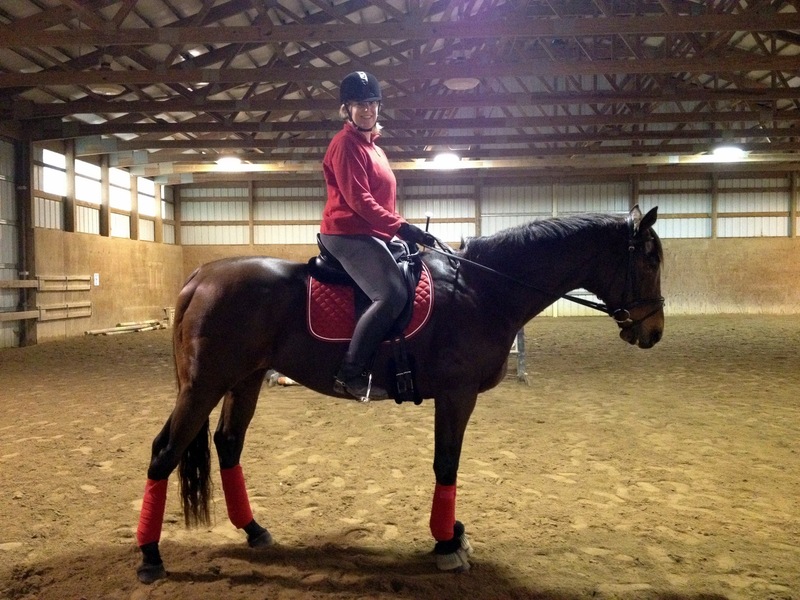 The canter is still very much a work in progress. 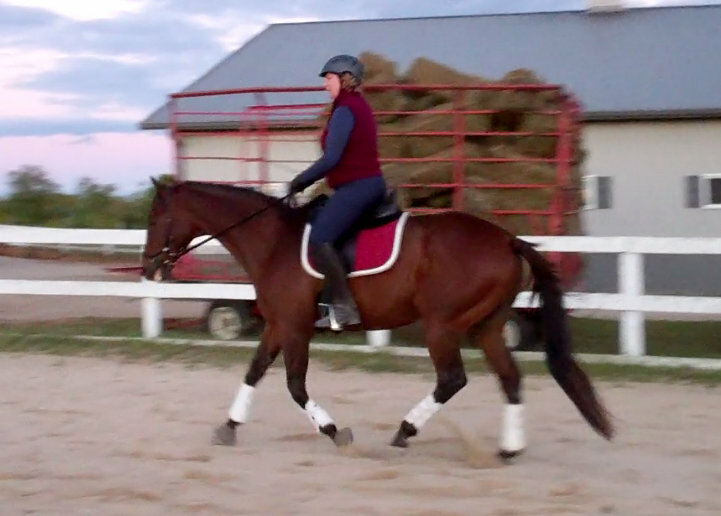 I’m looking forward to the day when I have the same influence over the canter as I do the trot. 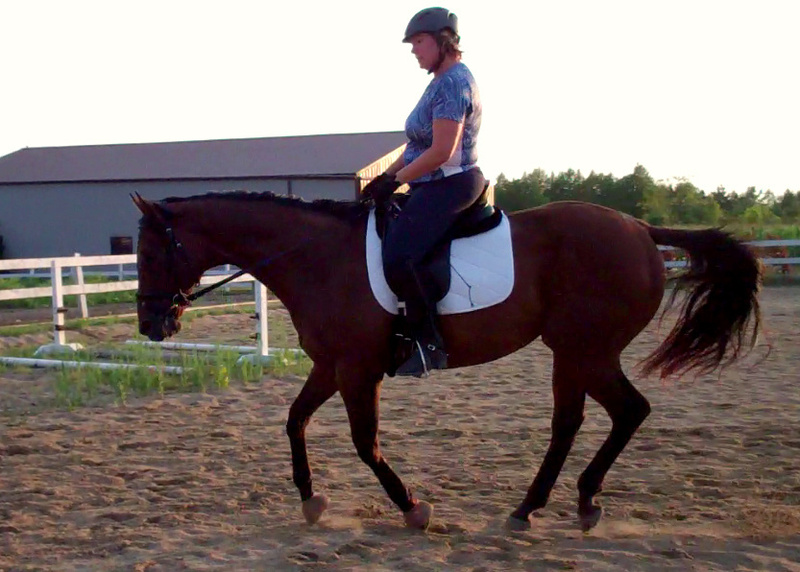 Right now I have two canters – crappy and decent. 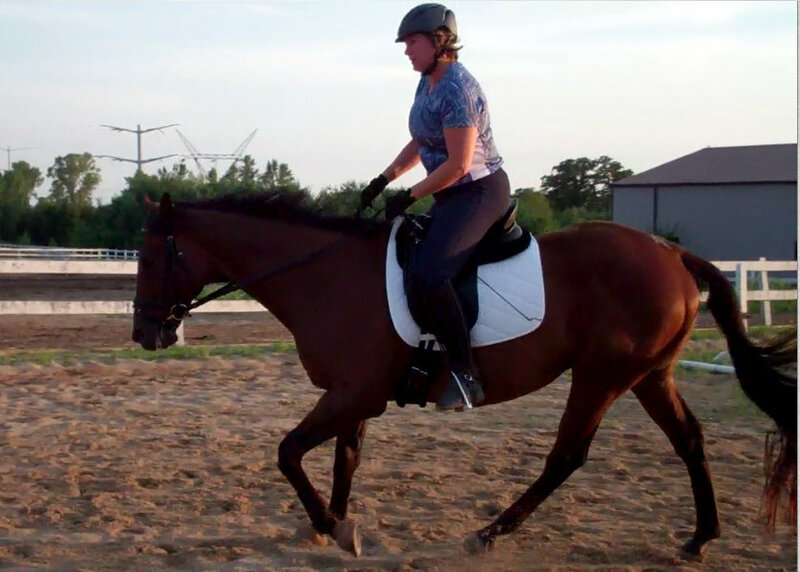 While “decent” is a start, it’s not “working.” I’m still developing my seat at the canter, and at the same time, I’m starting to think about getting the horse to move more forwardly, soften and engage his hind end. 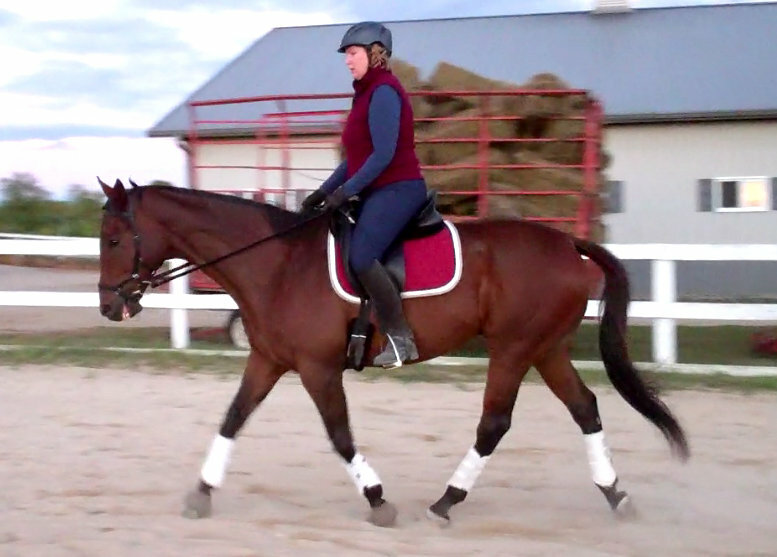 We have quite a way to go in this gait! 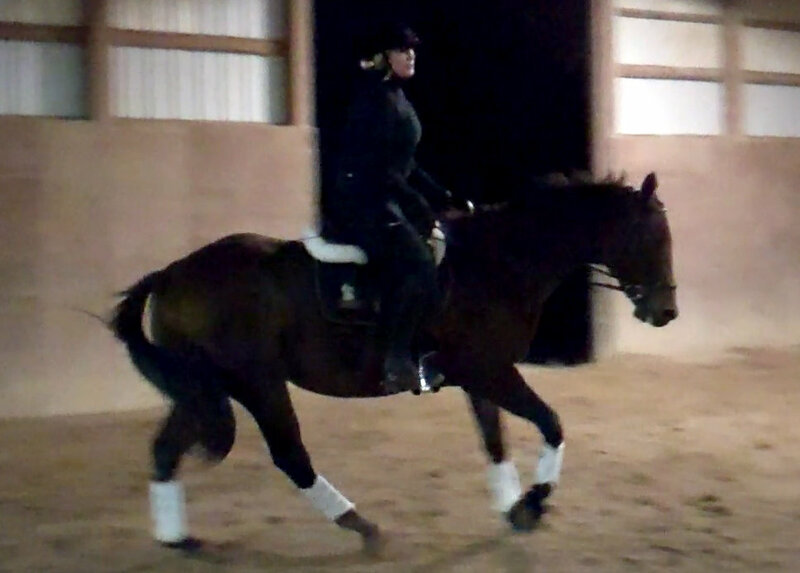 Last night’s theme was “decide to do it.” I had mentioned to Christy that I had difficulty maintaining a big, forward trot on a circle with correct bend and engagement. After putting us through our paces, Christy diagnosed that (again!) the issue was with the pilot, not the pony. 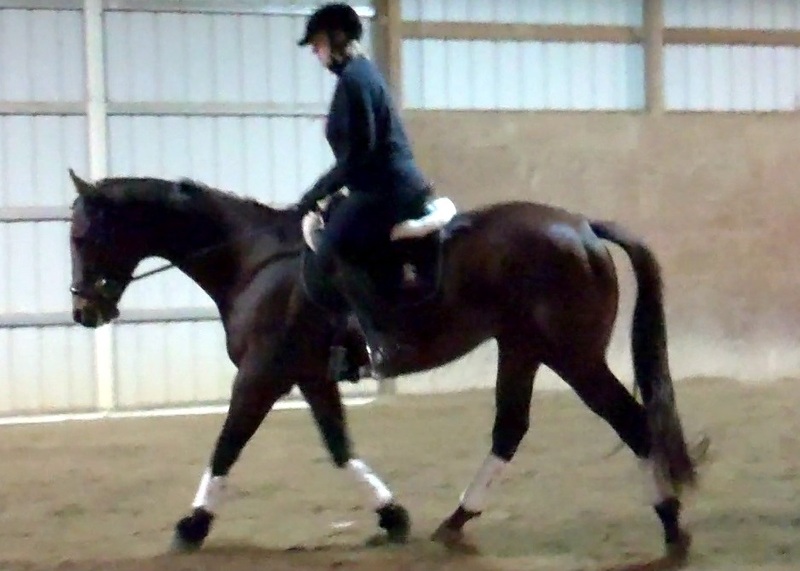 “Pretend Robert Dover is watching you,” she said, hearkening back to the clinic, in which we saw what happened when riders were asked to expect more of themselves, and their horses. “Decide how you’re going to ride and then do it.” So, I did. I closed my legs, and was fast with a thump of a heel or tickle with the whip if he started to stall out. Christy was right – it was more about making a decision and following through. 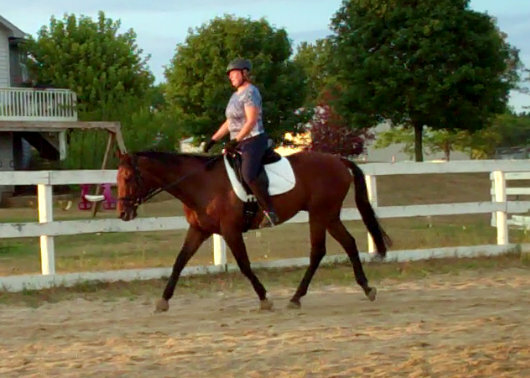 We finished the ride with few laps of big, forward, connected trot after all the work on the circles, and Derbs felt great throughout.